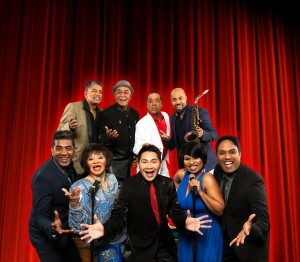 Izobell has assembled a stellar ensemble featuring himself, Terry Fortune, Terry Hector, Loukmaan Adams, Niesha Abrahams, Leslie Kleinsmith, Giempie Vardien, Nur Abrahams and Felicity Keran, accompanied by a 5-piece live band. Most of them have, at some point in their own careers, performed at The Lux (as it was and still is referred to today). Many top international artists, such as Connie Francis, Dusty Springfield, Engelbert Humperdink, Tom Jones, Percy Sledge, Peaches and Herb, Petula Clark, Jose Feliciano, Dobie Gray, Lovelace Watkins and many others, performed at the Lux. Local stars like Taliep Petersen, Zayn Adam, Jonathan Butler, Richard Jon Smith, Ricardo, Ronnie Joyce and Lionel Petersen are also just a few of the local music sensations who appeared on the boards. Well-known South African bands like The Rockets, The Bats and Rabbit and Ballyhoo were among the groups who battled it out. Remembering the Lux runs from 03 December 2015 to 09 January 2016 and booking is now open at Computicket on 0861 915 8000, online at www.computicket or at any Shoprite Checkers outlet. For discounted corporate or group block bookings, fundraisers or charities contact Sharon Ward on 021 680 3962 or email sharon.ward@uct.ac.za or Carmen Kearns on 021 680 3993 or email her at carmen.kearns@uct.ac.za. For further media enquiries please contact Fahiem Stellenboom on 021 680 3971, cell 072 2656 023 during office hours or email fahiem.stellenboom@uct.ac.za.